Here's a great way to demonstrate your LSE pride and help support the Student Union. In 1880, oarsmen from Exeter College, Oxford removed the college-colour ribbons from their straw boaters and wore them as neckties knotted four-in-hand. Shortly thereafter, they ordered a proper set of ties striped in the same colours. Very quickly, this trend spread throughout Oxford, to other British universities, and ultimately to secondary schools as far away as New Zealand. Today, the striped tie is a mark of distinguished membership. Do you have a proper LSE striped tie? Or crested cufflinks? Lapel pin? Golf shirt? Well, you should. After all, you survived one of the most difficult and prestigious academic insititutions in the world. You should have something to show for it other than lifelong writer's cramp and nightmares about finals. 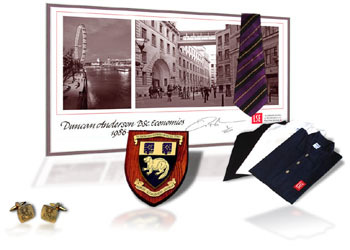 All joking aside, The LSE Student Union Shop offers a wide variety of logo apparel, engraved glassware, fine pens, and more. And, your purchases help support the Student Union. Visit The LSE Student Union Shop.